Please note: These items are also in the full 'Measuring Tools Clipart Pack'. This is a smaller set for those who only teach length. 1. You may not sell, distribute, trade or share my graphics in any way. 2. 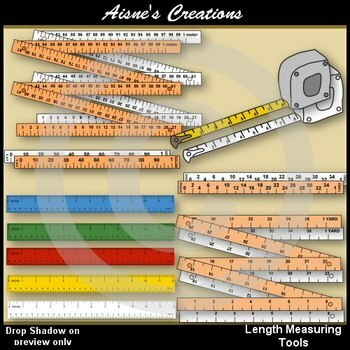 You may use the graphics in your classroom and in various teaching mediums including worksheets, displays, projects etc. 3. You may use the graphics commercially in teaching materials sold through stores such as TPT. 5. YOU must credit my TPT store - http://www.teacherspayteachers.com/Store/Aisnes-Creations - either on the product or in the products description if using them for freebies.